The holidays are coming up quick! What are you going to make for your friends? As a professional crafter, people are always expecting something totally unique. This year I decided to play with the classic exploding box and bring some more magic with my own version of a snow globe. Using my Cricut Maker™ and the new Scoring Wheel™ tool, I was able to cut each piece with precision and score crisp lines on my cardstock. Follow along below and make your own! 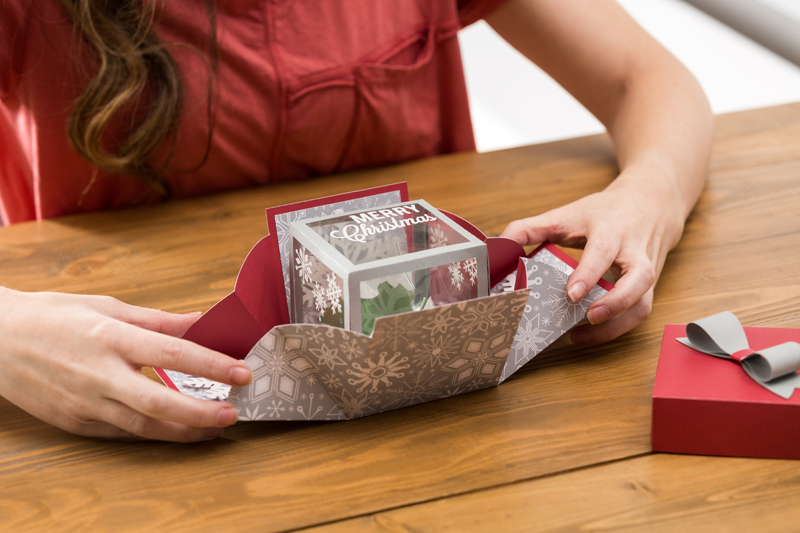 Begin by opening Cricut Design Space using this link to the project, Merry Christmas Exploding Box. This project makes one exploding box. Load your materials and let the Maker do its magic! Use one of the sharp hook Cricut® Tools Weeder. to weed the excess vinyl from your snowflake and Merry Christmas cut. 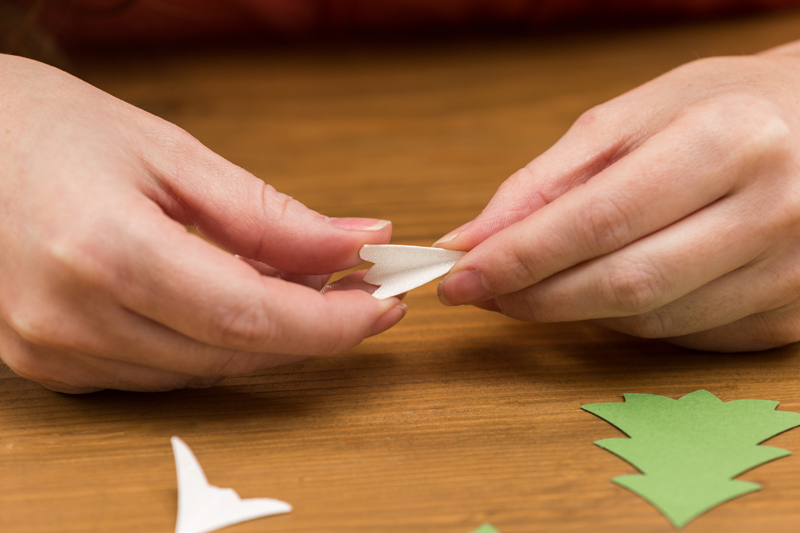 Using Cricut® Transfer Tape, transfer your image onto the acetate squares. Three of the sides have snowflakes across the top, one side has a deer in the bottom right, and the top will have the Merry Christmas image on the top right corner. Begin by trimming a piece of transfer tape to fit your vinyl image. Stick the transfer tape over your entire image and use your scraper to burnish the tape onto the vinyl pieces. Peel up one corner of the transfer tape and gently pull until the tape is off the liner. Place the transfer tape and vinyl onto the acetate square and burnish on with your scraper tool. Peel the transfer tape off, leaving the vinyl cuts on the acetate sheets. 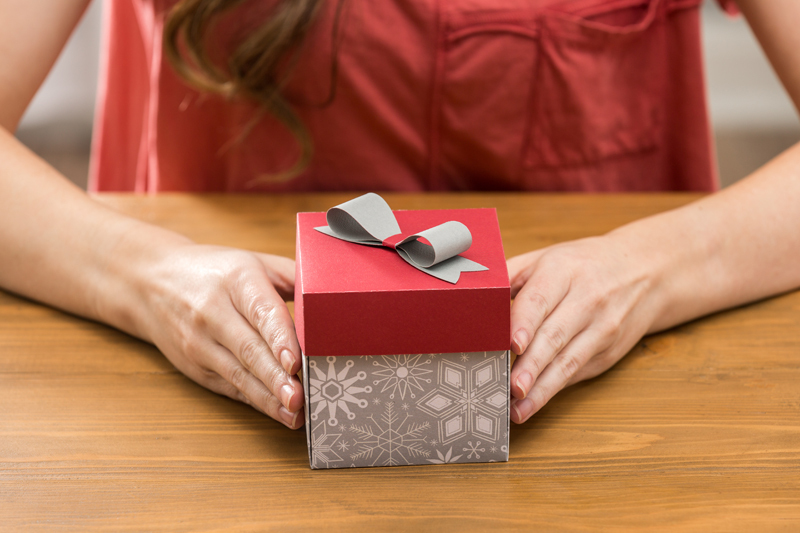 Fold the box along the score lines, and familiarize yourself with how it folds together. Then glue the windows into the inside of the box panels. Use the tabs and hot glue to form the box. Fold box on score lines and glue tabs to the adjacent panel to form corners. There should be four tabs at the bottom of the box to seal the globe later. Fold all of the trees in half on the score line. Adhere the white snow cap onto the top of the tree. 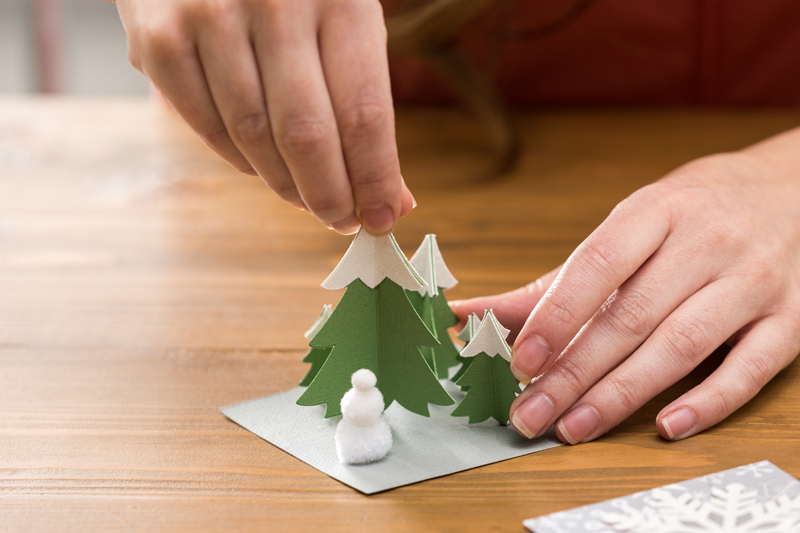 Use three trees, and glue the sides together to create a 3D tree. Take the top of the box and turn it upside down. 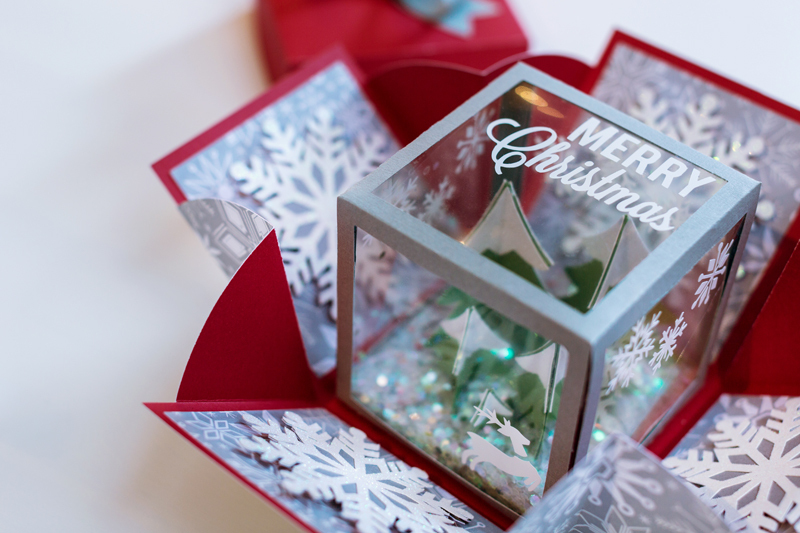 Pour some glitter in, then take the box base with Christmas trees on it and glue it to the tabs on the bottom of the box. Take extra care to seal it entirely with hot glue so no glitter gets out. Allow to dry completely before turning right side up. Glue the two layers of the snowflakes together, then use adhesive foam squares to attach them to the patterned snowflake panels. Fold along all score lines of the outside of the exploding box, then glue the completed scene box to the center square. Glue the snowflake panels onto the interior side panels of the box. Assemble the lid and bow of the box. Fold the sides up and place the lid on top. Now you have a one of a kind snow globe holiday exploding box! Beautiful!!! I can’t wait to try this. I love this!! I think during school break I’ll be making some with my 12 yr old Son. We love to craft together!